The pain of being unemployed is the worst. It may have an adverse effect on you and might even lead to depression. Many consider unemployment as a sign of failure. But it has nothing to do with failure. It is just a testing time. In this period instead of sulking and feeling pity about yourself, use this time positively. Do some smart things that will help you in your job search process. This guide will take you through some of the smart things that will improve your future resilience, and will keep your spirit high in this difficult phase. No one wants this unemployment period to last long. So instead of sitting and crying, you should use this period to develop a master plan to end it. The first step is staying organized. Don’t waste time, and don’t lose your focus. This doesn’t mean that you have to do job hunting all the time. Your daily routine should have the job hunting activities that directly or indirectly boost your chances of finding the job and some recreational activities. Along with job hunting and writing applications, read some blogs and other material related to your industry. Then keeping yourself fit is also essential. Proper diet and exercise should find a place in your daily schedule. Keep your house organized. Spend time in cleaning your house and removing all the clutter making way for some positive energy. By keeping everything organized around you gives you more time to focus on your career and that dream job quickly. Though the period of unemployment is not a bit low, you should use it as an opportunity to think about your career path. If you are a fresher looking for your first job, you should decide the industry of your preference and the job profiles that excite you. If you have some experience under your belt, you can use this time to evaluate whether the industry you were working in is suitable for you, did the job profile match your calibre or did you make a wrong choice. While working it is difficult to change your career path but this period of unemployment can be utilised to re-evaluate your career choices. When you convert your hobby or passion into your career you definitely excel in it. So, if you are not sure of your interests, you can take help from the career counsellor. The career counsellors are available online or you can avail their services at your local job centre. Also, there are certain career questionnaires online that can help you understand your passion and skills better. When you are already working it is so obvious that you do not have an updated resume. This unemployment gives you the opportunity to update your resume. Your focus should be more on the experience section, so start updating the information about the most recent job. Your resume should clearly tell what you bring to the table. If you have done some studies of late update that information in your resume. Change the overall design of your resume and proofread it well. For the fresh graduates, design a resume that is unique and helps you stand out in the crowd. As a fresher, your focus should be on emphasising the importance of your skills and qualifications. Video resumes are worth giving a try for both the fresh graduates and the experienced individuals to create a positive impression about you. Use this time to clean up your social media profiles. The employer’s today check you on the social media before inviting you for the interview, so make sure that everything is positive and pleasing. To make things simpler for you, you can have separate profiles for personal and professional work. If you don’t have a social media profile, create one on the platforms like Facebook, Twitter and Instagram. Do not forget the power of social media in finding a new job. When updating or creating your profile, focus on the relevant keywords based on your career path. The employers search the candidates on the social media platforms based on the keywords. Networking is the secret to landing a new job. A good network helps you to know the job openings and can also help in spreading a good word about you. Stay connected to all your family and friends. Join the relevant professional associations and sign-up with your alumni network. Attend the industry-specific seminars and participate in different job fairs. Read the online blogs, forums and participate in the online discussions. Social media offers plenty of options to stay connected. This is a great time to enhance your skills. You can either improve your existing skills or can learn totally new things to make your resume more attractive. If you are happy with your current career path, improve your existing skills. The technology always has something new and you should not lag behind. Learn the technological advances and keep yourself updated. If you want to change the career path, you can learn totally new skills in your chosen field. To acquire the skills, you can enrol full-time at a university, or you can take an evening or part-time courses or you can look for online courses. An idle mind is a devil’s workshop, so instead of sitting idle, you can think of taking some temporary jobs or freelancing. Temporary work online or offline can be beneficial as it not only gives you a financial boost, but it also gives you the experience. This is the time to indulge in your hobbies and earn some money from it. Volunteering is another good option as it helps to improve your skills and also networking. Find out the volunteering opportunities within your industry to increase your skills, gain experience and create new contacts with the industry people. 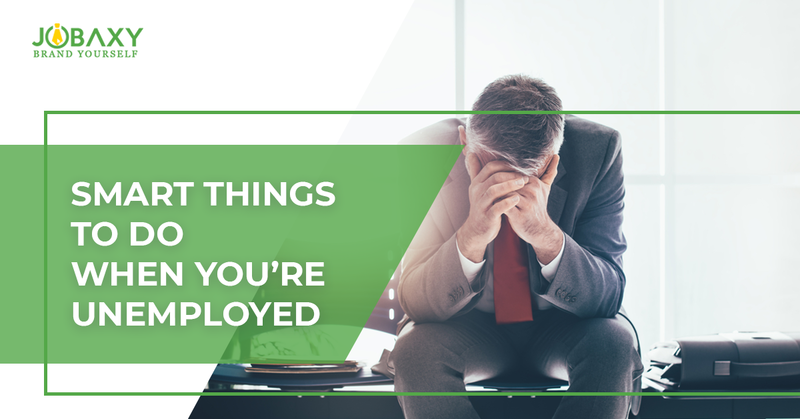 Though the temporary jobs and volunteering are the best options, if you are looking to get back to full-time work shortly, don’t lose your focus. Limit your working hours so that you get time for the job search. Finally, the most important point is being calm and having fun. You need to take care of your mental health in this trying time. You need a positive mood and for this relax and do things that you enjoy. To sum-up, unemployment is tough, but by staying positive and taking efforts to kill this period fast is beneficial.